Open Road Media Science & Fantasy, 9781504021456, 370pp. 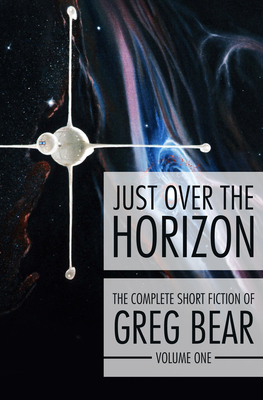 The New York Times Book Review hails this collection of thirteen dazzling stories and a rare screenplay by Hugo and Nebula Award-winning author Greg Bear as a "solid introduction to the oeuvre of a classic writer." - "Genius," the screenplay written for the television series Outer Limits, but never produced. Just Over the Horizon combines Bear's intense concern with the human condition with a deep understanding of science, resulting in a collection long to be remembered. Greg Bear is the author of over twenty-five books, which have been translated into seventeen languages. He has won science fiction's highest honors and is considered the natural heir to Arthur C. Clarke. The recipient of two Hugo Awards and four Nebula Awards, Bear has been called "the best working writer of hard science fiction" by the Science Fiction Encyclopedia. Many of his novels, such as Darwin's Radio, are considered to be classics of his generation. Bear is married to Astrid Anderson--who is the daughter of science fiction great Poul Anderson--and they are the parents of two children, Erik and Alexandria. Bear's recent publications include the thriller Quantico and its sequel, Mariposa; the epic science fiction novel City at the End of Time; and the generation starship novel Hull Zero Three.